Please describe the new equipment, its function, and why it is significant for the program. 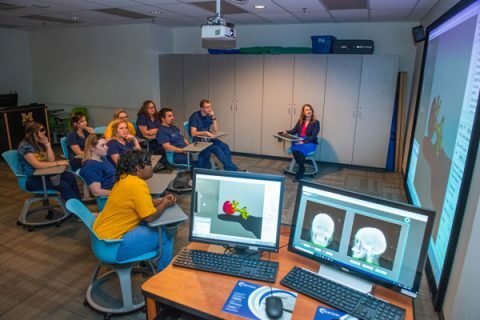 The purchase of a VERT (Virtual Environment Radiotherapy Trainer) for the Radiation Therapy program here at UM-Flint has been a dream come true. 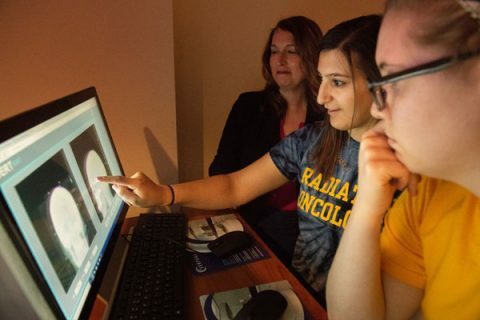 Our institution is fortunate to be one of twenty-three radiation therapy programs out of eighty-five in the United States to offer this amazing learning tool to our students. Currently, we have the only VERT system in Michigan. The VERT system is similar to a flight simulator for cancer treatment machines. The VERT system can be used in three- or two-dimensions. It has a projector with a floor to ceiling screen and includes a two-monitor console that looks and sounds like a treatment machine. It is the closest replica to an actual treatment machine but without the worry of ionizing radiation. This system can be used in all radiation therapy classes and bridges the gap between clinical and didactic coursework. UM-Flint currently has the only VERT (Virtual Environment Radiotherapy Trainer) in Michigan. 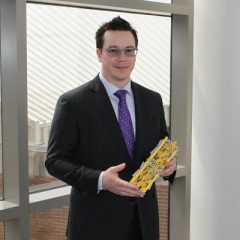 How will this equipment further the career development of the radiation therapy program students? How will it assist them in how they work with patients? As an instructor, I understand the challenges of helping students reach the ability to critically think through content and apply it to real world settings. I’m hoping that this system will help improve critical thinking in our students. I will eventually incorporate this new system in all radiation therapy classes. I will manage the class more like a facilitator by introducing a case and then allowing them to work through the process. A quick example would be working through a head and neck patient. I can have the students review treatment set-ups, radiation field borders, appropriate doses, critical structures, side effects and different treatment techniques. I can also use the CT (computerized tomography) data set to work through detection and diagnosis scenarios. I can break up each part and teach common risk factors, common sites for metastatic spread and other standard treatment options. 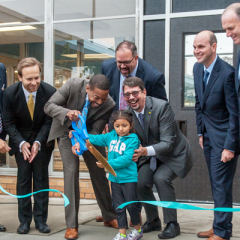 Our classroom becomes more infused with active learning where students will be more engaged. This engagement will hopefully transfer to higher critical thinking in a clinical environment. The technology is a bridge between classroom and clinical learning. What does this investment signify about the commitment the university has for its students? The VERT system has the potential to revolutionize education of radiation therapists in the U.S. Here in the United States only 27 percent of radiation therapy programs have this system. This commitment to our students is a promise to provide a relevant educational experience that is respected throughout the country. Research shows that students who train in simulated environments are more confident in their clinical abilities. How does this equipment contribute to the long-term strategies and offerings of the program? 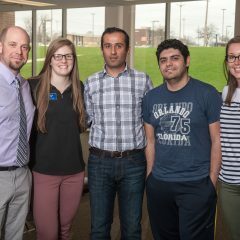 Does it have the potential to attract future students? I just recently was awarded a Course Design Fellowship through the Thompson Center for Learning and Teaching (TCLT). Currently, I’m working on problem based learning activities to incorporate in the radiation therapy courses for the Fall. Eventually, all radiation therapy courses will be using the VERT system. I also hope to create a library of activities for students to use as a resource on their own. Incorporation of this new technology is not only beneficial to the field of radiation oncology but also health care in general. 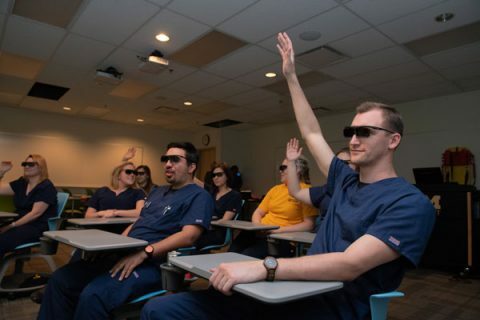 Simulation is becoming a necessity in health care education and there is evidence to prove that students who spend time in a simulated environment are more confident in their clinical abilities with patients. 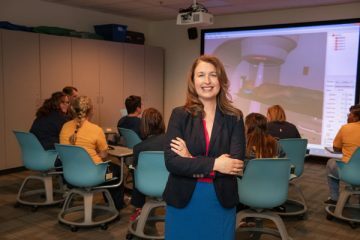 I have received institutional review board (IRB) approval with an exempt determination and hope to demonstrate how this system can improve critical thinking skills in radiation therapy students. This idea can also be cross-referenced to other health care programs. I am hoping to build a template for my problem-based learning activities that help foster critical thinking. This is a universal need and I plan to share my process and research with others. The installation of the VERT system for our radiation therapy program demonstrates how dynamic our program is. Students will hopefully be inspired to learn more about the profession and our respected program. Students will become more aware how rewarding a career in radiation therapy truly is.